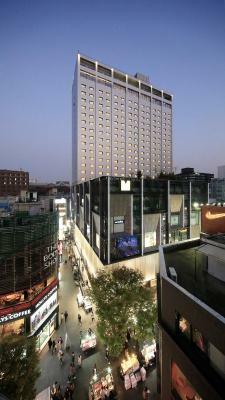 Lock in a great price for Solaria Nishitetsu Hotel Seoul Myeongdong - rated 8.9 by recent guests. 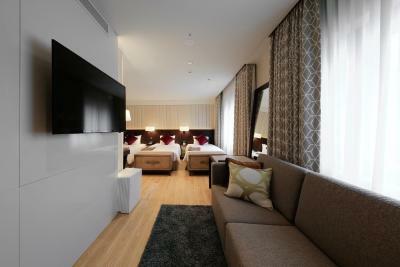 Very convenient place, 3 mins walk to subway station and airport bus pick up. Good for family, will definitely stay again when visit Seoul next time. I have requested in advance a letter in the hotel check on a high floor. 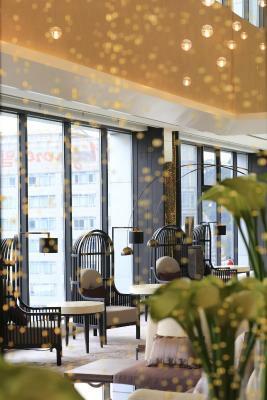 The hotel is located from the 7th to the 22nd floor of the building and the choice of floors was the main one when booking. The hotel in a personal letter through the Booking confirmed the settlement is on a high floor. I was expecting a minimum of 15 floors. But the hotel was settled on the 8th floor (room 810). That is, the second floor of the possible 15 floors of the hotel. Thus, the hotel did not fulfill its promise. For this I reduce the score by two points. I was disappointed from the start. If you promise, do it. If you can't do it, don't promise. The services stated cooler with water and ice on the floors. There was a cooler on the floor. But no water, no ice in it was not from the day of arrival to the day of departure. For this I reduce the score by one point. Otherwise, I liked the hotel. Clean, warm. Good location. Nice staff. Prefect location for family trip as its easy for us to travel around by walking distance to a lot of food restaurant and shopping and train station. All the staff very friendly and helpful. great location and convenient to subway and airport bus stop. I stayed in a double alone at the end of the corridor which is squarish in layout. I especially like the window with the view of the city in my bathroom. The bedroom though didn’t have a window was well lit with lights at the right places. 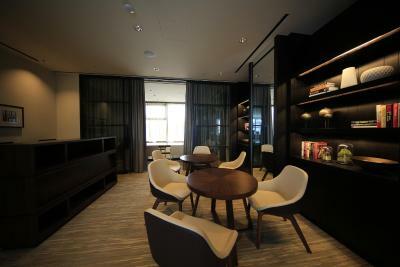 The room has the trappings of a hospitable Japanese hotel with thoughts in the little details. 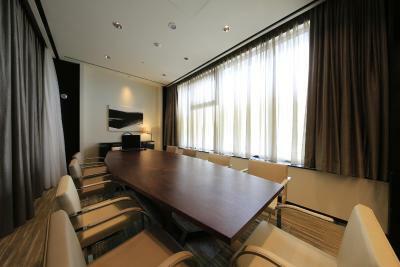 The location is fantastic with shopping, eateries and transportation. The airport bus no. 6015 stops outside at the main road which is a 3min walk. 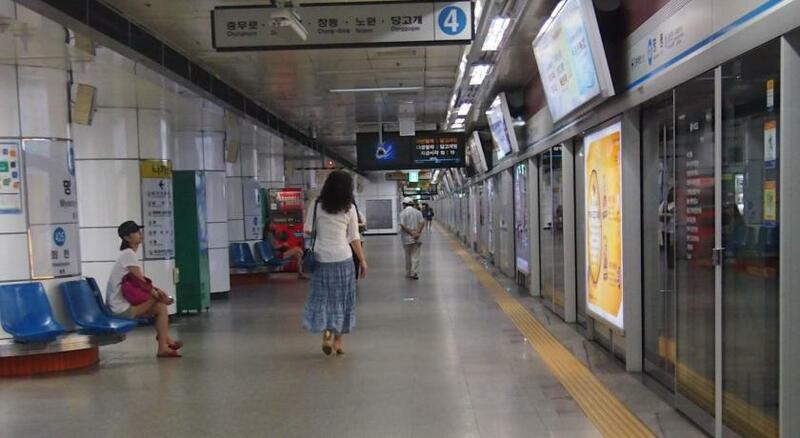 Myeongdong station exit 8 is also about there next to the bus stop. I would stay here again without a second thought. Location is great. Close to shopping and dining. 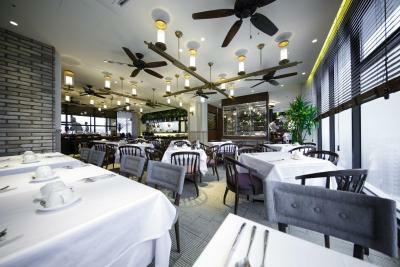 We can also choose to dine within the building as there is direct access to the restro floor of the mall, which keep us "cold safe". 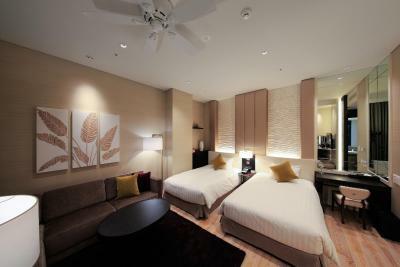 well equipped room and convenient location for shopping. 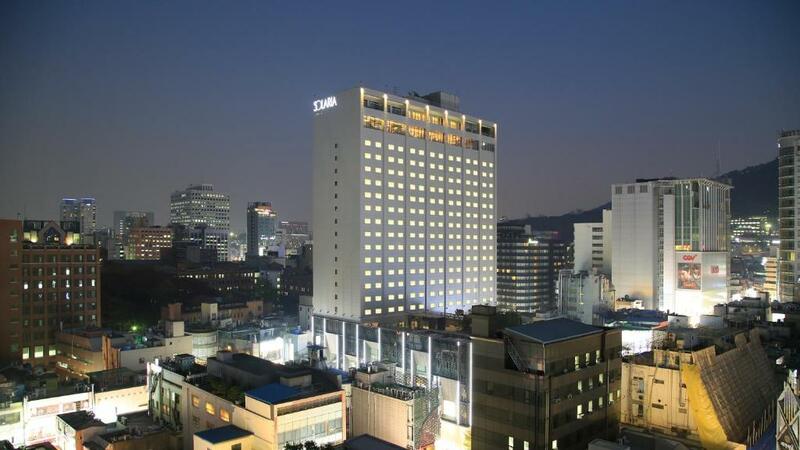 Solaria Nishitetsu Hotel Seoul Myeongdong is situated in the Jung-Gu district of Seoul, and is 350 yards from Myeongdong Cathedral. 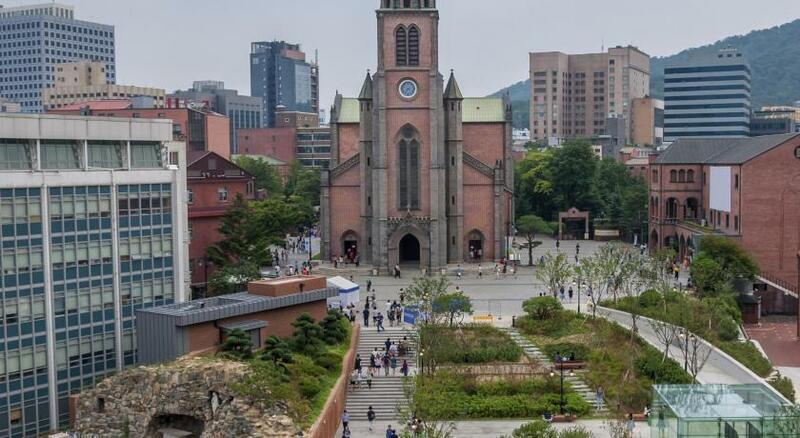 The property is close to several noted attractions, around less than 0.6 miles from Namdaemun Market and around 1.2 miles from Jongmyo Shrine. The hotel offers an International restaurant as well as free WiFi. 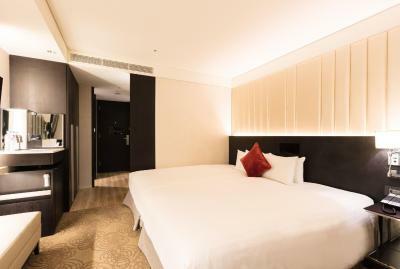 The rooms at the hotel are fitted with a seating area, a flat-screen TV with cable channels and a private bathroom with free toiletries and a bath. The rooms include a kettle, while some have a balcony. 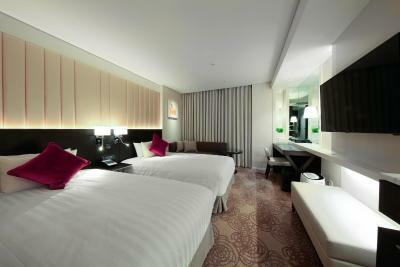 Guest rooms at Solaria Nishitetsu Hotel Seoul feature air conditioning and a desk. 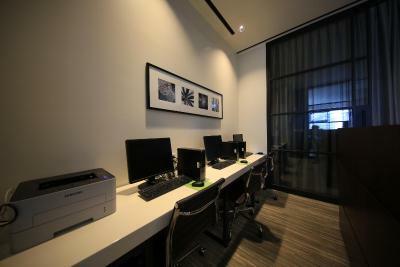 For guests' convenience, the accommodation has a business centre. 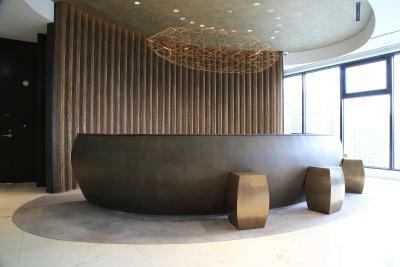 Speaking English and Japanese at the reception, staff will be happy to provide guests with practical information on the area. Jogyesa Temple is 1.2 miles from Solaria Nishitetsu Hotel Seoul Myeongdong, while Bangsan Market is 1.2 miles from the property. 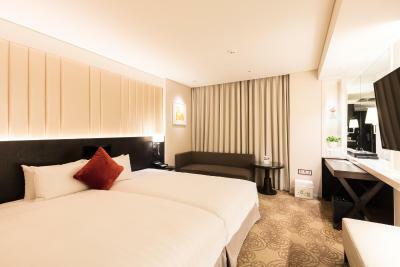 Solaria Nishitetsu Hotel Seoul Myeongdong has been welcoming Booking.com guests since 5 Jun 2015. 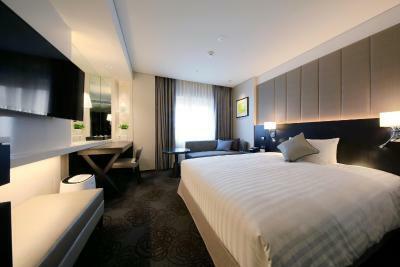 When would you like to stay at Solaria Nishitetsu Hotel Seoul Myeongdong? This twin room features a cable TV, soundproofing and bathrobe. This triple room features a electric kettle, bathrobe and soundproofing. This double room features a seating area, bathrobe and soundproofing. This single room has a bathrobe, air conditioning and electric kettle. This twin room has a electric kettle, soundproofing and bathrobe. This twin room features a bathrobe, electric kettle and soundproofing. 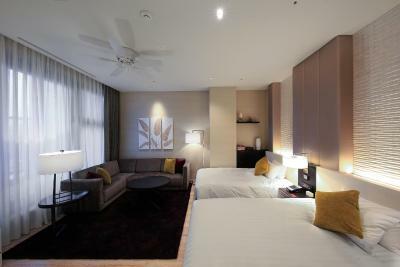 This double room features air conditioning, flat-screen TV and soundproofing. 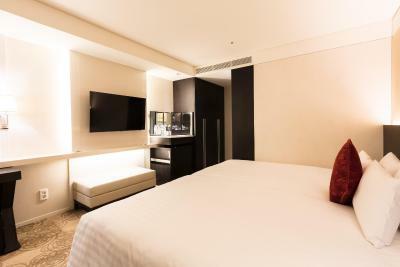 Hotel surroundings – This neighbourhood is a great choice for travellers interested in shopping for cosmetics, shopping and shopping for clothes – Check location Excellent location - show map Guests loved walking around the neighbourhood! House rules Solaria Nishitetsu Hotel Seoul Myeongdong takes special requests - add in the next step! Solaria Nishitetsu Hotel Seoul Myeongdong accepts these cards and reserves the right to temporarily hold an amount prior to arrival. 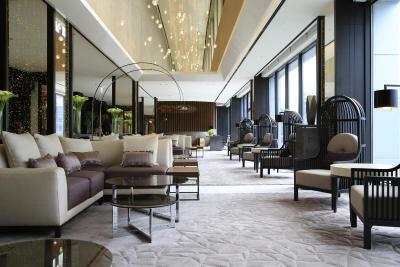 Guests are required to make a deposit of KRW 100,000 upon arrival for incidentals. This deposit is fully refundable upon check-out. 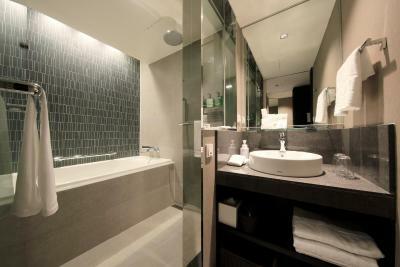 The bathroom/shower were super clean and modern and the bed was very comfortable. Also, the hotel was very quiet, even though it was in such a busy area. 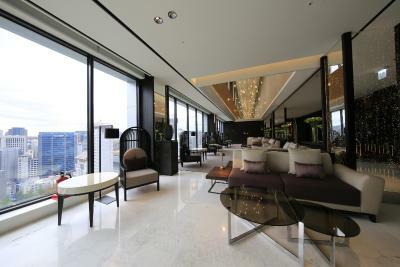 The location was fantastic- right in the middle of Myeongdong and close to subway lines 4 and 1. 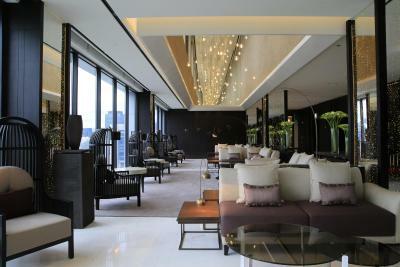 The lobby/breakfast room were nice as well, with a good view of the city! Taxi's and other transportation not allowed within 200 meters of the hotel. Does not state this at booking. The location was great for shopping. Breakfast was good and plentiful. There were no cutlery and plates, sugar, milk in the room. It was a bit noisy in the morning and at night as I could hear the door of other rooms slamming when guests enter and leave their rooms. 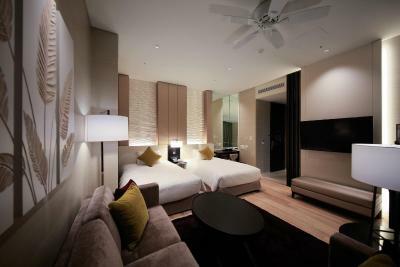 The single room I occupied was nice, cosy and well furnished. Room was on the smaller side, particularly if you had bigger suit cases. You need to work with the tour pickups to determine exact location if one had to wait in the 1F waiting area or the 21F main lobby. Central heating was still on, so AC was not working, the room temp could go as high as 75F in the evening. Breakfast was a little pricey. The King sized bed and the separate toilet room from bath were perfect. The breakfast was convenient, featuring Asian buffet. 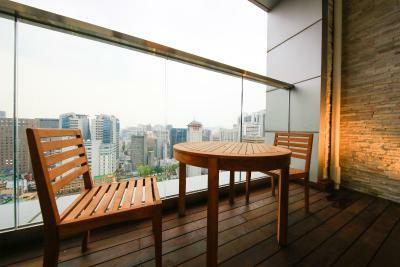 The location was great, in the heart of MyeongDong. Accessible to stores, train and transportation. Not car accessible, but tours do stop by the lobby to pick you up. 1. We were very uncomfortable because the room was too warm. We tried to turn on the AC but it did not work. When we contacted the hotel - they explained that the AC did not work at this time of the year and to turn off the heat & open the window. The window did not open very widely so it did not keep us cool very well. It was very difficult to sleep at night because it was too warm in the room. 2. We stayed at this hotel last October 2018 and our visit was comfortable. But this visit was not as comfortable because of the bed - it felt very hard. 3. The towels looked very worn out/ old. The location in Myeongdong is excellent. I really liked the snail moisturizer amenities. Breakfast spread should varies everyday. Had breakfast for 4 days and it seems that only 1 dish was different every other day. The separation of bathroom and toilet. I wasn't a big fan of the service, having stayed in 4 and 5 stars hotels all around the world, I feel like this one doesn't deserve the stars. The check-in took some time while everything was booked in advance - nobody helped us with our 6 luggages, we were nicely asked to handle it by ourselves. When asked for plug adapter, we had to go all the way up to the lobby (in the middle of the night) to pick it up because no one would bring it to our room. When we left half empty mugs in the room (old water, old coffee) we would come back to the room and find the dirty mugs/bottles. Also if you're not Asian, you might get very disappointed with the breakfast menu as there aren't many western options. Overall we had a good stay because we were out all day with my friends, and we would just come to shower and sleep, but Solaria need to improve the service. I will definitely not go back there next time I visit Seoul. Maybe you could improve the breakfast menu, maybe make it a bit changes each day rather than the same menu everyday, I stay there for a week and my breakfast will always be the same menu.